Photosynthesis in plants is dependent upon capturing light energy in the pigment chlorophyll, and in particular chlorophyll a. This chlorophyll resides mostly in the chloroplasts and gives leaves their green color. The range of light absorption in leaves is extended by some accessory pigments such as the carotenoids, but does not cover the entire visible range - that would make the leaves black! Some plants and plantlike organisms have developed other pigments to compensate for low light or poor use of light. Cyanobacteria and red algae have phycocyanin and allophycocyanin as accessory pigments to absorbe orange light. 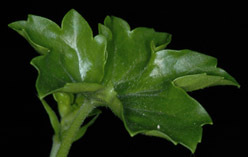 They also have a red pigment called phycoerythrin that absorbs green light and extends the range of photosynthesis. The red pigment lycopene is found in vegetables. Some red algae are in fact nearly black, so that increases their photosynthetic efficiency. Brown algae have the pigment fucoxanthin in addition to chlorophyll to widen their absorption range. These red and brown algae grow to depths around 270 meters where the light is less than 1% of surface light. But the most advanced plants are the land plants, which have the least advanced system for gathering light! Why are leaves not black? Chlorophylla-a is the primary pigment for photosynthesis in plants. Its structure is shown at left. It has the composition C55H72O5N4Mg. It exhibits a grass-green visual color and absorption peaks at 430nm and 662nm. It occurs in all photosynthetic organisms except photosynthetic bacteria. Chlorophyll-b has the composition C55H70O6N4Mg, the difference from chlorophyll-a being the replacement of a methyl group with a CHO. It exhibits a blue-green visual color and absorption peaks at 453nm and 642nm. It occurs in all plants, green algae and some prokaryotes. There is usually about half as much chlorophyll-b as the -a variety in plants. Chlorophylla-a is the primary pigment for photosynthesis in plants, but the range of light absorption is extended by chlorophyll-b, beta-carotene and other accessory pigments. The variations of chlorophyll-b and the bacterial version are indicated above. The range of light absorption is extended somewhat toward the middle of the visible spectrum by the content of carotenoids in leaves. The colors of the carotenoids are familiar as the fall colors of leaves. As the leaves lose their chlorophyll, the more persistent carotenoids give the pleasant reds, yellows and oranges of the autumn foliage. Beta-carotene is the most important of the carotenoids. Lycopene, the color of tomatoes, is also a carotenoid. Beta carotene is the most important of the carotenoids that serve as accessory pigments in Photosynthesis. Measurement of the absorption of these pigments as a function of photosynthetic output makes it clear that the chlorophylls are the most important, but that beta carotene contributes. Beta carotene gives its color to the carrot, and also to squash, bananas and avocados. It also appears in autumn leaf colors. 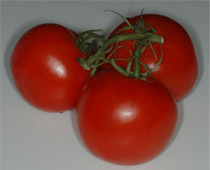 Lycopene is familiar as the red color in a tomato.